As always in the summer, the price dropped slightly in July. 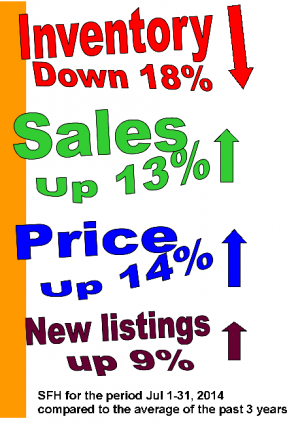 Sales activity is still strong, and more homes are being listed compared to historical averages. Inventory is still low. 19% of homes sold for list price or higher. If you bought an average home in Calgary in July 2013, the price has increased $29,000 in the past year. This entry was posted in Bidding wars, Calgary SFH, Market update, Month-end, Predictions. Bookmark the permalink.